Ready to get crafty and dress up plain gifts with me? 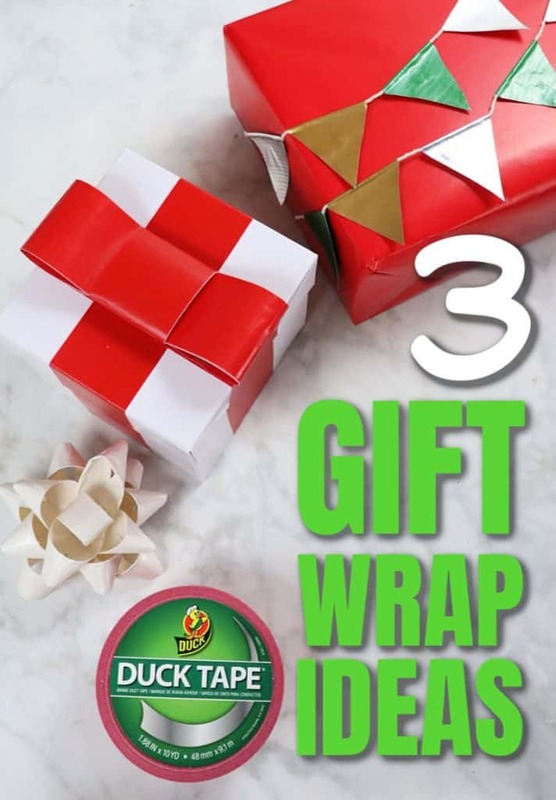 I am sharing 3 Christmas gift wrapping ideas today using Duck Tape®! 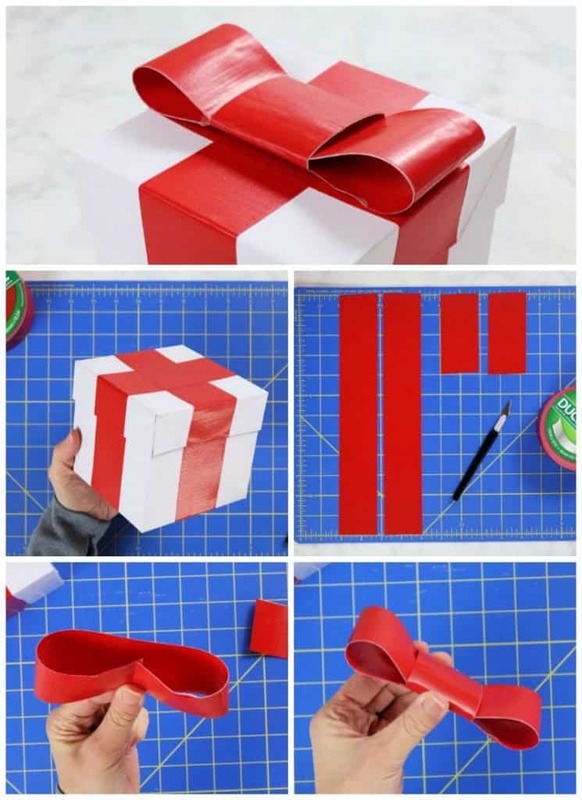 These techniques are easy to pick up and make your plain wrapped presents stand out. Wrapping can be as much fun as gifting, I promise. Duck® brand duct tape in red, green, gold, silver and white. Or one of their many other colors or patterns. 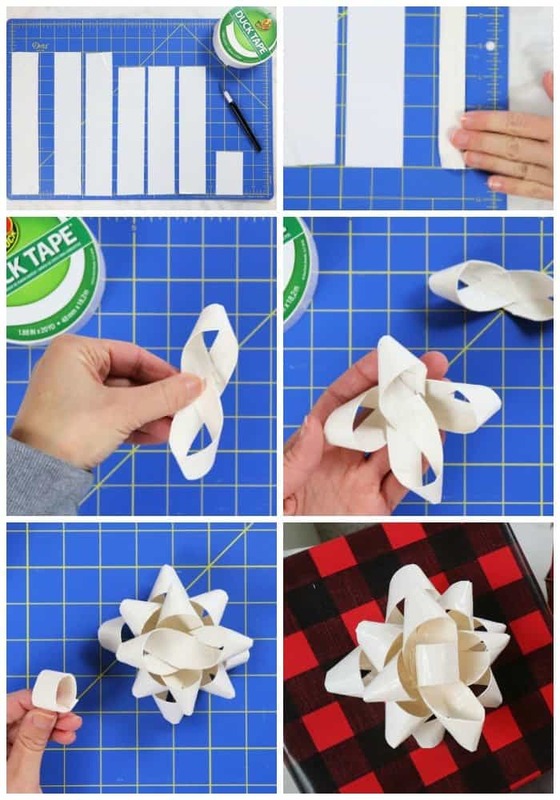 The easiest way to cut Duck Tape® and create with it is by using a cutting mat. The tape easily pulls off and the lines help you measure and cut. A craft knife won’t get stuck to the tape like some scissors. Many of thees crafts can be made with ribbon or paper, but I love using Duck Tape® because it’s strong and durable. It’s going to hold up on your presents under the tree and when you’re transporting them. Nothing like losing a bow in the wind while walking into Grandma’s house. Cut 7 strips of Duck Tape®, 3 at 10 inches 3 at 9 inches and 1 at 3 inches. Using the measuring lines on a cutting mat, fold each strip over onto itself to make 3/4 inch strips so that the entire sticky side is covered. Next, take the 6 longer strips and fold them into double loops securing with a small piece of tape. Fold the small 3 inch strip into a loop. Start laying the double loops on top of one another, using tape in between, to make a full bow. Finish the layering with the loop in the center. Tape this bow onto any box to give it some instant style! Measure a length of twine to wrap around your gift. 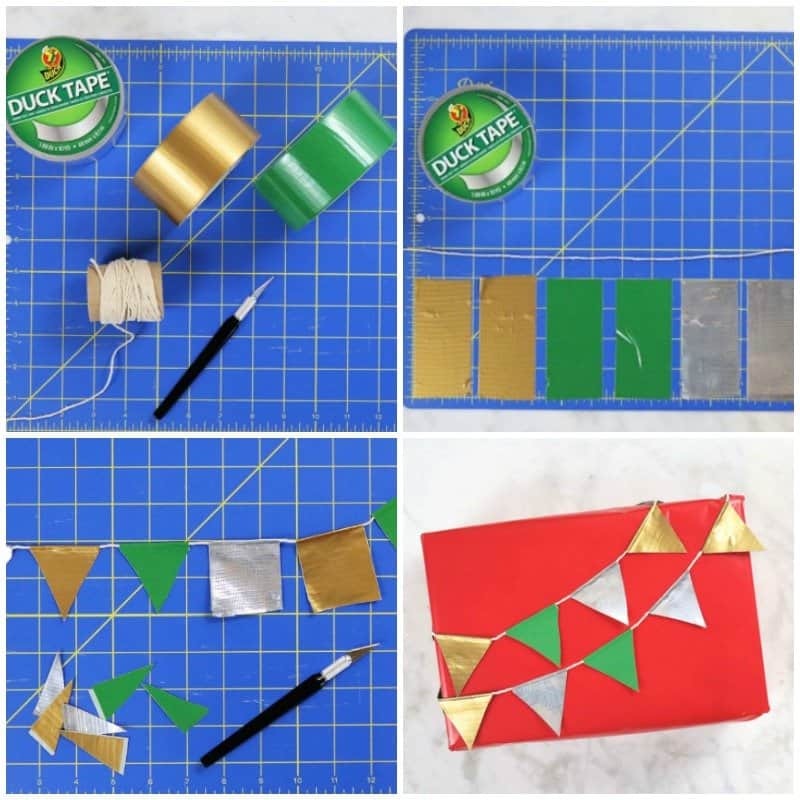 Then cut 4 inch strips of gold, green and silver Duck Tape®. Fold each strip in half over the twine and press together. Then using a craft knife, cut each piece into a triangle. This makes a pretty and colorful bunting that can be wrapped around a gift. 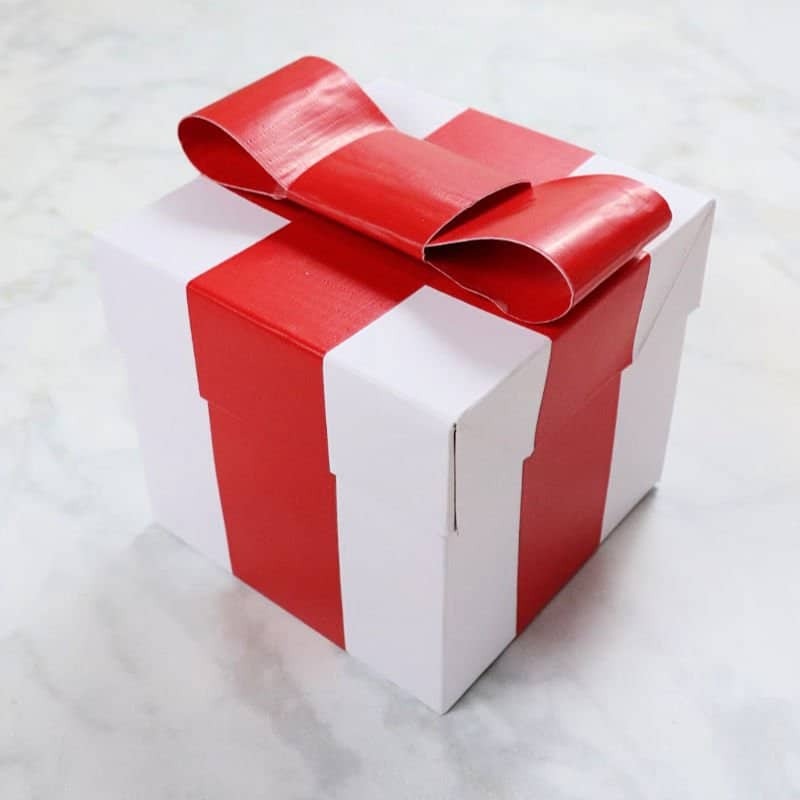 This gift box bow is ideal for a box with a lid. 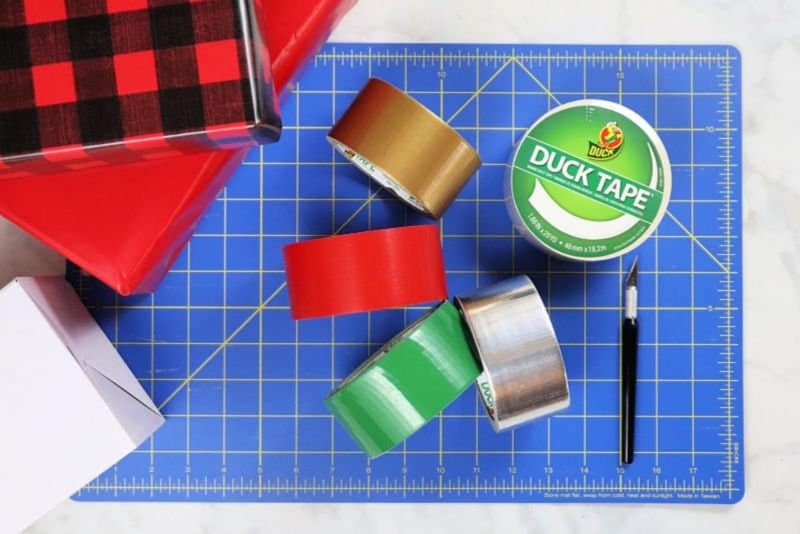 Start by wrapping red Duck Tape around the bottom and top of the box separately, this allows the gift to be wrapped, but the recipient can easily open it. Measure 2 12 inch strips of Duck Tape® and 2 4 inch strips and carefully press the sticky sides together to give you 2 solid strips. Fold the long strip into 2 loops and secure with tape. Then fold the small strip around the middle and secure with tape to complete the bow. Stick this to the top of the box for a beautiful gift box bow that can be reused again and again. If you like this post be sure to pin it and use these steps to create your own creative Christmas gifts. These creative Christmas gift wrapping ideas are as fun to make as they are to give. Using Duck Tape® means they will hold up and can even be reused. 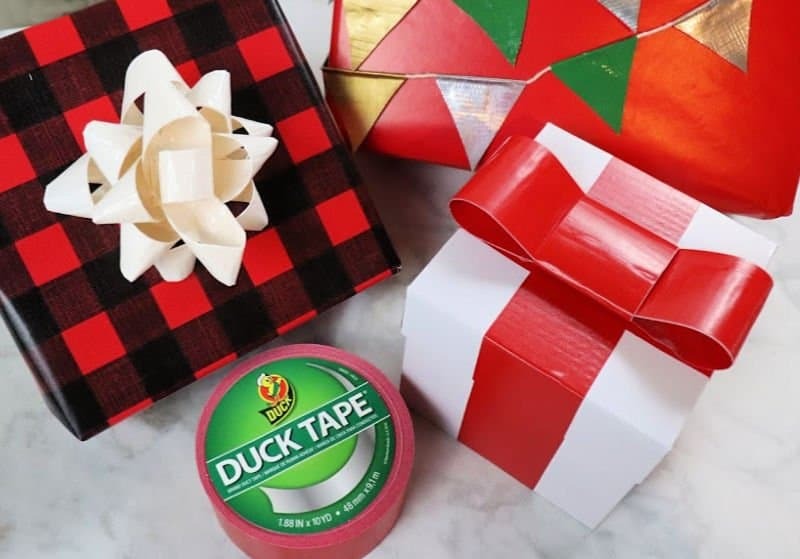 Check out all the Color Duck Tape® available and create some pretty wrapped gifts this season. I love the bows but the bunting is so cute!!! Holy Moly those bows look you just went to the paper store and bought them off the shelves. You are so talented. Oh my word! I never would have thought to use Duct tape for gift wrapping. My bows might just survive attacks from my crazy cats!! These are so durable, great for cats!